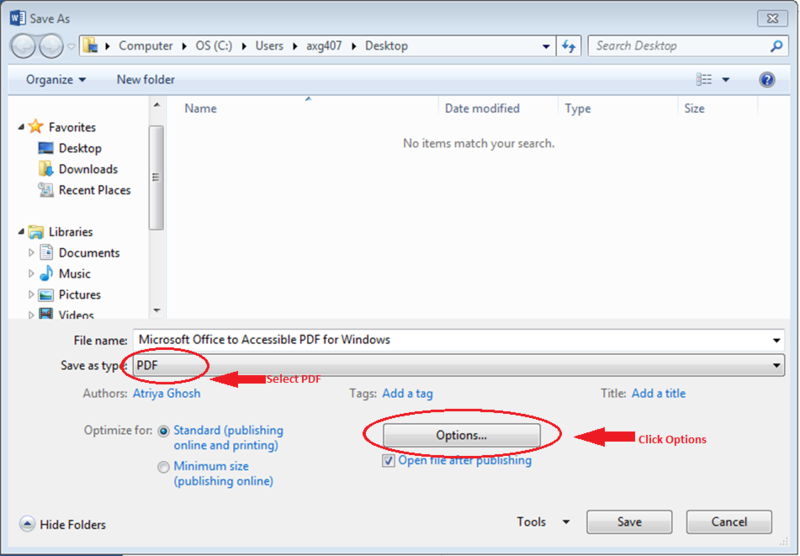 In Microsoft Office 2013/2010 (specifically Word, PowerPoint, Excel, and Access), it is possible to create a “tagged” PDF. 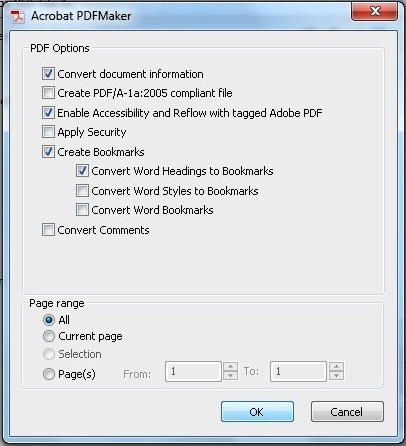 Tagging sections of a PDF is a way to programmatically specify the order of the file’s elements. This will allow visually impaired users to more easily navigate the document with assistive technology, and will reduce the amount of work needed to optimize the PDF for accessibility later on. 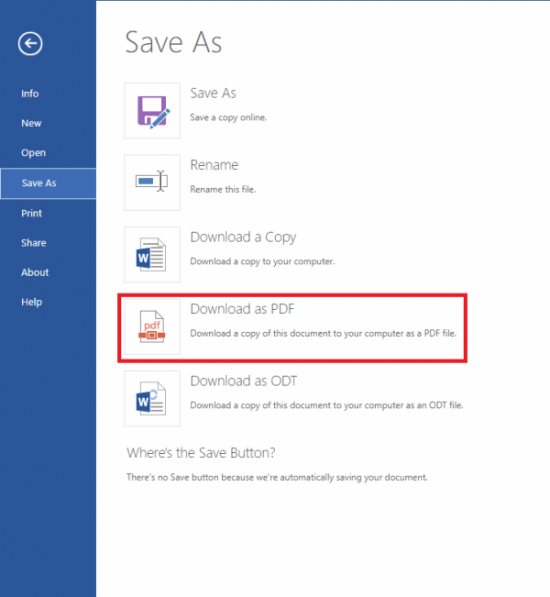 This page gives instructions for creating a tagged PDF in Microsoft Office 2010 for Windows. Note: Creating a tagged PDF does not fully guarantee that it is fully WCAG compliant, but for many Office documents, a tagged PDF will add many important accessibility features. Create an accessified Word, PowerPoint or other Office 2013 file, following the recommendations for Word accessibility and PowerPoint accessibility. Select the Computer option, then select My Documents, Desktop or Browse option to select your specified directory. Click the Options button to open a new window. 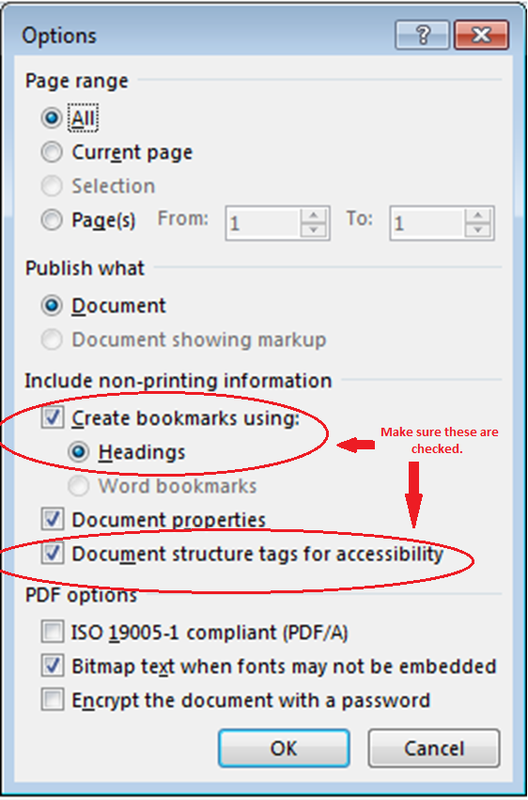 Ensure that the “Document structure tags for accessibility” option is checked. Create an accessified Word, PowerPoint or other Office 2010 file, following the recommendations for Word accessibility and PowerPoint accessibility. 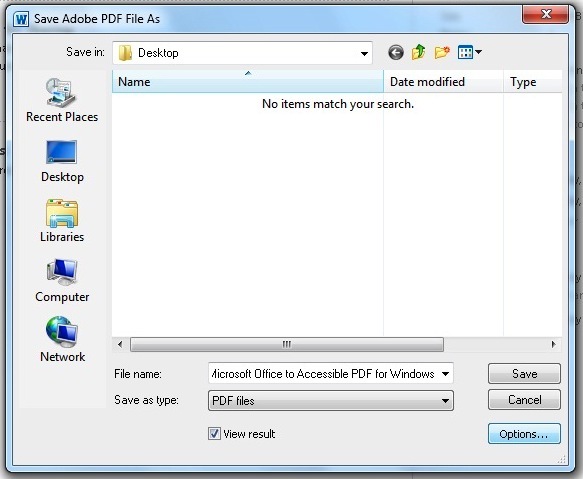 Open the PDF in Adobe Acrobat to verify reading order and tagging. In Adobe Acrobat, confirm that the reading order is set correctly. NOTE: This is important for documents with multiple columns, shapes and/or text boxes. Heading text is tagged as H1, H2 or other appropriate heading tag. Images are marked as “Figures”. Right click the tag to ensure that there is ALT text. Table tags should also include appropriate table heading (TH) tags for cells in the first row (i.e. at the top of the columns. To be fully WCAG compliant, a PDF document should include a language tag for English or other language. Refer to the PDF Files for more information. Note: The Accessibility Team can test sample PDF documents to ensure they are screen reader accessible. Contact accessibility@psu.edu to request a test.